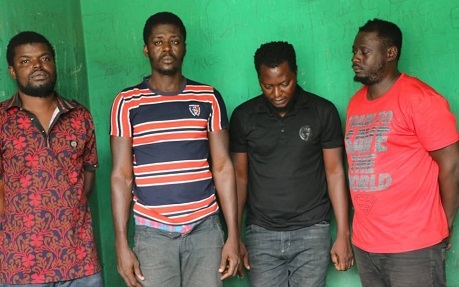 The four policemen who were dismissed and subsequently charged to court on offences of Armed Robbery, Kidnapping, Unlawful detention, Intimidation and threatening violence being the report of the Investigation carried out against them when one Mr Chukwudi Godwin Odionye popularly referred to as 'Bishop' submitted a petition against the four on 2nd day of May 2018. The petitioner in his petition stated that on the 4th of June 2017, he was in his house around Alagbado Lagos when the four armed men stormed his house to effect his arrest on the allegation of performing 'FAKE' miracles. He stated that after his arrest, he was taken to one hotel at Agege where he was detained and threatened to be killed if he fails to cooperate. He explained further that on the following day 5th June 2017, he was taken to bank where he was made to transfer seven million Naira to one of the operative's account. On the strength of Investigation it was revealed that no proper police procedure for Investigation was followed in Mr chukwudi's arrest and that the four SARS operatives actually abducted the man from his house and Unlawfully detained him in the hotel under the guard of the suspects for personal gain. The Police Public Relations Officer of zone 2 command, CSP Dolapo Badmos while parading the suspects reiterated the AIG'S directive that the force will not tolerate any act of misconduct that undermines the value of International best practices of policing as she stated further that any police officer or men found guilty will not be spared.